The past few days has been the busiest part of Halley’s summer, with Ernest Shackleton arriving – after a few days delayed by sea ice – for the annual relief of the station. This involves removing all of the cargo and fuel destined for Halley from the ship and transporting it to the station, ~30km away. My job in this was as a sea ice drivers mate, on the night shift. 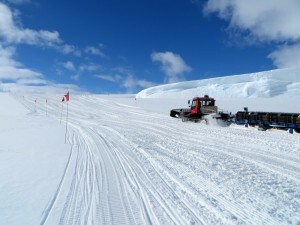 This involves following a Pisten Bully on a Ski-Doo, to render immediate assistance in case of the sea ice cracking and also to help with hitching the machine to the sledges used for moving cargo. Working ship-side, I was staying on the Shackleton for the duration. 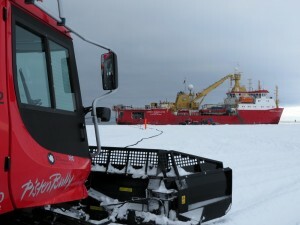 The first night we mainly moved fuel, shuttling it between the ship and the large bulk fuel tanks waiting on the shelf ice. These larger tanks are too heavy when filled to be safe on the 2m thick sea ice so a smaller transfer tank is used, taking about five rotations to fill a bulk tank. 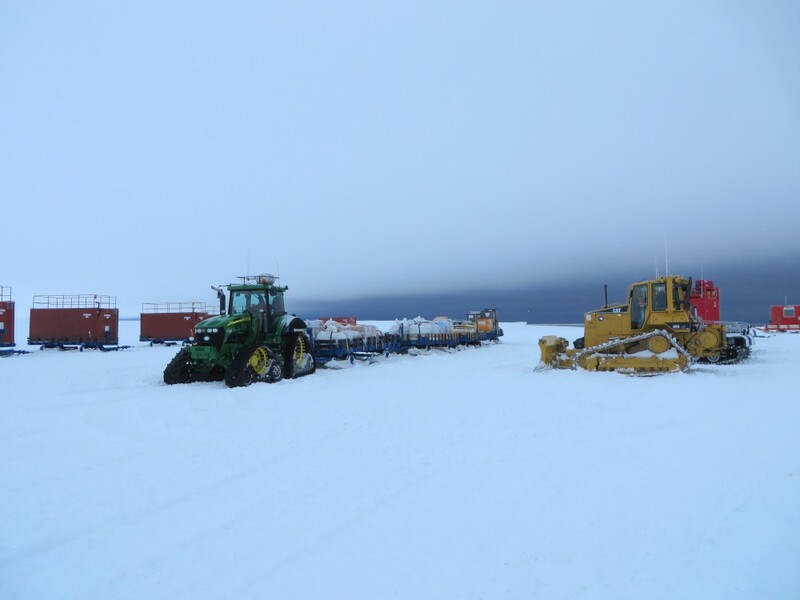 Towards the end of the shift the ship was ready to unload cargo so we began moving sledges to the ship for loading, before leaving them on the ice shelf edge from where were the taken to the station in sets of four by one of two John Deere tractors. The fuel and cargo continued through the second shift and by the third we finished bulk fuel and were left moving drums of fuel, which are preferred by pilots as they are sealed and so more reliably water free (but are still tested before use!) Surprisingly, we were finished with the cargo by the fifth shift so we could begin loading the ship with outbound cargo and waste, which is essentially the same process in reverse. Once relief had finished, the remaining 2014 wintering staff were invited for lunch on the ship – during which the ice we had been driving on for the week broke up when the mooring lines were removed (the ship was holding position with thrusters while they prepared to leave.) A new safe edge was made and the crew craned us off onto the remaining, secure, ice and we proceeded back to station ready for the summer season to really get under way.